When you think of safaris in South Africa, there’s one word that instantly comes to mind: Kruger. Known the world over for its beauty and biodiversity, the vast Kruger National Park has it all. Lions, rhinos, elephants, leopards, buffalo, antelope… the only thing missing from this living, breathing nature documentary is you. Isn’t it time you discovered Kruger's unique charm for yourself? On this 11 day bucket list adventure, you can do just that. Soak up the cosmopolitan vibe of Cape Town, a cultural melting pot set in the shadow of Table Mountain, and discover the magnificent beaches, coastal villages and surprising wildlife of the Cape Peninsula. Stop for a chance to spot penguins at Simon’s Town, plus visit the famed Kirstenbosch Botanic Garden. In Kruger, answer the call of the wild with three unforgettable nights at the four-star Mjejane River Lodge, searching for wild lions, rhinos, elephants, rhinos and more on up to five safari game drives in open-air vehicles. With return international flights, two internal flights, eight nights accommodation, English-speaking guides and more, this package has everything needed for a once-in-a-lifetime adventure! Have more time? Choose the 14 day package with Victoria Falls pre-tour extension, and discover why this thundering waterfall is considered one of Zimbabwe’s most spectacular natural sights. Today depart from Sydney, Melbourne, Brisbane, Adelaide or *Perth for Cape Town! Fly with airlines such as South African Airways, Singapore Airlines or Etihad Airways to name a few (subject to availability). Upon arrival into Cape Town, you will be met and transferred to your hotel. The remainder of the day is free at leisure. An eclectic mix of contemporary boutique and old-world charm, The Cape Milner Hotel is a modern, boutique-style living in a secluded, yet convenient location. The Cape Milner Hotel in the city centre of Cape Town is located at the base of Signal Hill in the trendy neighbourhood of Tamboerskloof. This 4 star hotel offers an ideal location overlooking the city and Table Mountain. This sophisticated Cape Town hotel is situated within walking distance to the city center while the trendy Kloof and Long Streets are only a 5 minutes’ walk away providing guests with easy access to some of the best restaurants, pubs and nightclubs in Cape Town. Each room enjoys spectacular views of the beautiful Cape mountains, including that of the renowned Table Mountain, and offers en-suite bathrooms, air conditioning, wireless internet connectivity, complimentary tea/coffee making facilities, remote control television, hairdryer and mini safe not to mention MNet and DSTV viewed on LCD flat screens in the bedrooms and plasma screen in the suites and luxury rooms. A courtesy shuttle service to the Cape Town city centre and Victoria & Alfred Waterfront area is also available to guests free of charge. After breakfast, enjoy a half day Cape Town city tour. Including all the 'must-sees' of any Cape Town day tour, this introduction is a geographical and cultural extravaganza, showing you Cape Town, from its historical beginnings to the dazzling modern shopping malls of the Victoria & Alfred Waterfront. End the tour by taking an optional ride on the cable car up Table Mountain (the ticket is not included as it is weather dependent). Return ticket is approx. $30 AUD per person. This awe-inspiring tour to the towering headland known as Cape Point encompasses magnificent beaches, breathtaking views, and picturesque coastal villages. The Cape Peninsula is one of the world's most scenic areas and stretches from the city centre all the way to Cape Point. In Simon's Town you will stop for the chance to see penguins and to have lunch (not included). On the way back you will also visit the beautiful Kirstenbosch National Botanical Garden. Note: The drive via Chapman's Peak is subject to the road being open. Ou Kaapse Weg (mountain pass in Cape Town) will be used as an alternative route when necessary. Today is free at leisure to explore the beautiful city of Cape Town. Alternatively take part in an optional activity. This delightful drive winds its way to the heart of the Cape Winelands, through superb mountain ranges, vineyards and Cape Dutch homesteads. Head off to the wine country via the N2 to the heart of South Africa’s wine industry, Stellenbosch, boasting great beauty and culture that is steeped in South African history. Walk down the canal-lined avenues, in the shade of giant oak trees and beautifully preserved historic buildings. With the sheer vastness of wine estates on offer, we are truly spoilt for choice when we enjoy our first wine tasting of the day at the Waterford Estate or similar. Travel over the Helshoogte Pass to the town of Franschhoek, historically dating back to the 17th century when the French Huguenots arrived. Billed as the Gourmet Capital of South Africa, this charming town, in a most picturesque valley, retains a French Huguenot style. We enjoy a wine tasting before taking time to enjoy the fabled culinary skills of the Franschhoek chefs at one of the many award winning restaurants (lunch not included in cost). Onward to Paarl, one of the Cape’s first farming districts. The town is set at the foot of the cluster of remarkable granite domes from which it takes its name. The last stop for the day is at a wine estate on the Paarl wine route. Return to the bustle of city life after an enthralling day in the countryside, arriving back at the hotel early evening. This morning you will be picked up and transferred to Cape Town Airport in time for your flight onwards to Nelspruit. On arrival, you will be met and transferred to Mjejane River Lodge in the Kruger National Park (approx 1-1.5 hours from airport to safari lodge) where you may enjoy the remainder of the day at leisure. From the first friendly welcome, to your journey of discovery through the African bush with an experienced game ranger at your side, to a starlit dinner around a dancing fire, to the individually decorated luxury bedrooms, Mjejane River Lodge is a truly unforgettable destination. Mjejane Game Reserve is fully absorbed into the Kruger National Park. Therefore, all fences between the Mjejane Reserve and Kruger were removed and the animals move freely. Safari viewing and experience is therefore much better than being in a private reserve. As you are aware the Kruger National Park is the third biggest game reserve in the world and has the widest array of fauna and flora in the world. It is simply unbeatable as far as safari is concerned. The lodge also has the unique setting overlooking the Crocodile River therefore all rooms have a view and direct access to the lush gardens. It is possible to view animals from the lodge itself. A fabulous Boma dinner (outdoor restaurant under the stars) is served every second or third day to allow guests to experience an authentic African style of dining and a local African dance group perform at a nominal cost to add to the flavour of the evening. Safari drives are offered to lodge guests twice a day – once early morning and again in time for sundowners in the late afternoon, and depending on the time of year you visit, each experience can be unique. After your morning safari and breakfast, it’s time to check out. You will be picked up and transferred to Nelspruit Airport, where you will fly to Johannesburg. Upon arrival you will be met and transferred to your hotel accommodation for an evening at leisure. Located in the heart of Sandton, the 4 star Signature Lux Hotel is a short walk from the popular Nelson Mandela Square and Sandton City Shopping Centre. This morning you will be collected from your hotel and luggage and set out on a day tour of Johannesburg’s Soweto area. Soweto is a place of contrasts: pitted roads and littered sidewalks offset green parks; a mishmash of tin shanties; some their original grey or red brick, others beautifully renovated and some turned into luxurious mansions. The area is rich in history of the apartheid movement and also responsible for many political, sporting and social luminaries, including Nelson Mandela and Desmond Tutu - two Nobel peace prize laureates, who once lived in the now world famous Vilakazi Street in Orlando West. First stop on this tour is the Apartheid Museum where you will have 2 hours at leisure to explore this famous and important museum. Afterwards enjoy a traditional Sowetan lunch then head of on a 2 hour guided Tuk Tuk tour. On this Tuk Tuk tour there will be 2 adults per Tuk Tuk. Tuk Tuks will leave in a convoy and stop at numerous landmarks where the each Tuk Tuk driver/guide will provide detailed insight about the significance and history of specific Soweto landmarks along with cultural insight to the area. Upon completion of the tour you will be met and transferred onwards to Johannesburg Airport for your return flight to Australia, departing this evening. Today depart from Sydney, Melbourne, Brisbane, Adelaide or *Perth for Victoria Falls, Zimbabwe (Via Johannesburg)! Fly with South African Airways. Please Note: If departing on the 14 Day Cape Town to Kruger Package with the Victoria Falls Pre Tour Extension your departure date is 3 days prior to the dates stated in the Important Information section and online checkout. Upon arrival into Victoria Falls, you will be met and transferred to your hotel. Check in will be from 2pm onwards. The remainder of the day is free at leisure. This morning you will be collected and transferred to the Falls. Visiting the Victoria Falls is a truly awe-inspiring experience – the sight, the sound, the smell; the humbling feeling that here indeed is Nature's Supreme Masterpiece. No photograph can begin to depict the reality…and nothing prepares you for your first sight. This tour is conducted in the morning. En route, clients may be taken past the ‘Big Tree’ where they may stop and take photos. Clients will be accompanied through the Rainforest by a qualified guide who will give a brief history of the Falls themselves as well as detailing the flora, fauna, bird & wildlife and other points of interest. Guides are also happy to assist travellers with photographs whilst visiting this most spectacular of waterfalls. Raincoats are provided when needed. Today you will have a morning and early afternoon at leisure. In the late afternoon, you will be picked up and transferred to the jetty for your scheduled Zambezi Sundowner Cruise. The Zambezi Sunset cruise is a superb way to relax and enjoy the spectacular beauty of the Zambezi River. Clients may have the opportunity to see a variety of game; including hippo, crocodile, and elephant as well as enjoy the many different bird species. The Zambezi Sunset cruise is one of our most popular activities and includes finger snacks, beer, wine, local spirits and soft drinks. 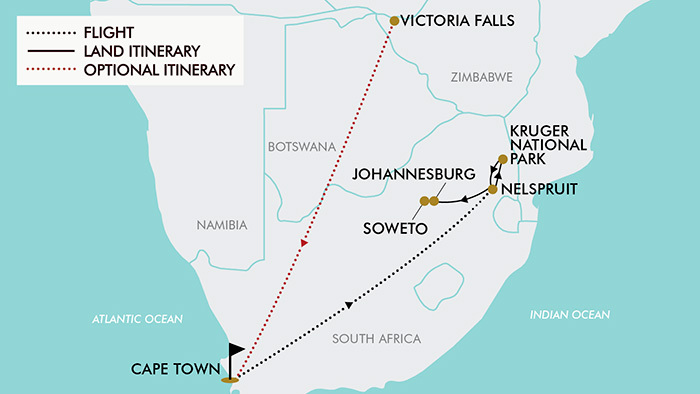 Today after breakfast you will check out of your hotel and be transferred to the airport to board your connecting flight from Victoria Falls to Cape Town, South Africa. Upon arrival into Cape Town, you will be met and transferred to your hotel, where the extension tour concludes and you meet the rest of the tour group. Optional Activity: Cape Winelands Full Day Tour - $115 per person This delightful drive winds its way to the heart of the Cape Winelands, through superb mountain ranges, vineyards and Cape Dutch homesteads. Head off to the wine country via the N2 to the heart of South Africa’s wine industry, Stellenbosch, boasting great beauty and culture that is steeped in South African history. Walk down the canal-lined avenues, in the shade of giant oak trees and beautifully preserved historic buildings. With the sheer vastness of wine estates on offer, we are truly spoilt for choice when we enjoy our first wine tasting of the day at the Waterford Estate or similar. Travel over the Helshoogte Pass to the town of Franschhoek, historically dating back to the 17th century when the French Huguenots arrived. Travel offer is valid for travel on selected dates until the 27th November 2019. - This option is not available to customers purchasing the 14 Day Cape Town to Kruger package with Victoria Falls pre tour extension. - Valid for Children/infants 6 years old and over. Minimum group size 2, maximum group size 12 per vehicle. - Only regular-shaped bags may be checked in. This means that the bags must have at least one flat surface to be accepted. - Round or irregular-shaped bags will not be allowed. - Bags with long straps will not be allowed. Cape Town has a Mediterranean-style climate: wet and cool winters, dry and warm summers. The annual average temperature in Cape Town is a delightful 17°C. January is the hottest month in Kruger with an average temperature of 27°C and the coldest is June at 16°C with the most daily sunshine hours at 9 in September. The wettest month is December with an average of 94mm of rain. Some meals are included in the tour, for all other meals; lunches and dinners the tour leader (when available) will offer assistance with reservations, suggestions and directions to local restaurants. It is your responsibility to notify TripADeal of any dietary requests/requirements. Please note; we will do our best to meet your requests/requirements, however cannot guarantee that we will always be able to. Please note: a basic level of fitness will be required. If you have any concerns please consult your healthcare provider prior to purchase/travel. Gratuities (tips) are not included in the tour price for services of the tour leader (when available) and driver throughout the tour and are optional at the customers discretion. Visas are not required for South Africa when travelling on an Australian passport. A single entry visa can be purchased on arrival in Zimbabwe for approx. $30 USD (approx. $42 AUD) when travelling on an Australian passport.